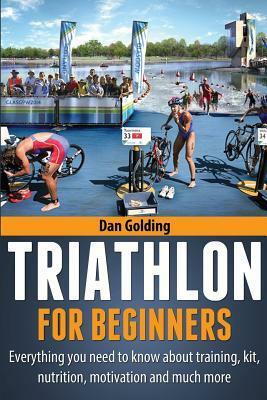 Triathlon For Beginners: Everything you need to know about training, nutrition, kit, motivation, racing, and much more is a book by Dan Golding. I was keen to read it to see how my current knowledge matched up. As it turns out, it matches up reasonably well. If you’ve been around the triathlon world for any amount of time, or done a few, you will probably know a lot of what is in the book. But that doesn’t mean it isn’t interesting. Golding goes deeper into the science of each aspect so unless you really know your stuff, there is something to learn. Take nutrition, for example. I knew we had around 90 minutes of glycogen. But, after that is gone, exactly how many kcals do I need to put in my body to keep going, and at what rate? Everyone is different, of course, but Golding provides a guide. He also expounds on an important concept that books are picking up on more and more (including mine): you have to remind the reader that reading this book isn’t enough; they need to put it into practice, too. How much this helps, I’m not sure. But the anecdotes about what happens probably do help. Between Golding’s recollection of being unable to get his wetsuit off, and my own experience of running out of T2 still wearing my cycling helmet, I think I’ll think I’ll be able to convince myself that transition practice is time well spent. If you’re thinking about taking up triathlon, or you’re still in your first season, this book is worth reading. This entry was posted on Thursday, December 7th, 2017 at 11:00 am and is filed under Books, Sport. You can follow any responses to this entry through the RSS 2.0 feed. Both comments and pings are currently closed.